"Windows Vista Security Center - Discover How to Protect Your PC!" Windows Vista Security Center is not new as Microsoft already added this feature in Windows XP Service Pack 2 (SP2). In Windows XP SP2, Security Center was designed to track the system's firewall, virus protection, and Automatic Updates configuration to ensure that each were enabled and as up-to-date as possible. In Windows Vista, Security Center has been dramatically updated in order to support new security features. The main purpose of the security center is to ensure that those features are enable and up-to-date. If they are not, Security Center will display its shield icon and alert you via pop-up balloons. From the Control Panel dialog box displayed, click the Security option. Then, click the Security Center option. This will display the Windows Security Center window and we can start to change the settings on it. By default, you only can see four security options, however clicking on the down arrow to the right of the option will expand it. 1. Windows Firewall: Security center ensures that it's enabled and protect your PC against hacker, malicious software, etc that may come to your PC. 2. Automatic Updates: Security center ensures that it's enabled to automatically download and install critical security fixes from Microsoft website the moment they are released. 3. Antivirus protection: Security Center still checks to ensure that an antivirus service is installed, monitoring and the definition are up-to-date. 4. Spyware and other malware protection: Vista introduces Windows Defender, Microsoft's antispyware and antimalware tool. The Security Center ensures that Windows Defender is enabled, active, and using up-to-date spyware definitions. 5. Internet security settings: Security Center ensures that Internet Explorer (IE) 7 is configured in a secure manner. If you change any IE security settings, Security Center will warn you constantly about this issue. 6. User Account Control (UAC): Security Center ensures that the UAC is active. 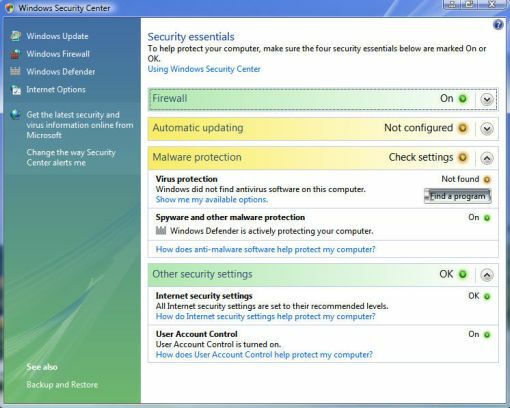 Normally, you will not see the Windows Vista security center if all the settings are active and up-to-date. However, if one or more of these features are disabled, misconfigured, or out of date, Security Center will alert you.